Alex is having a rough year: after a painful incident at a party in which he attempted suicide by swallowing Pine-Sol, his friends have all abandoned him, his parents don't trust him, and his older brother James acts like he's a complete stranger. So Alex befriends the boy next door, ten-year-old Henry, whose Mom is flighty and whose father is absent. He also makes friends with James's friend Nathen, who encourages him to join the cross country team. As his friendship with Nathen slowly turns into something more, Alex regains his confidence and he and James learn what it means to be brothers. 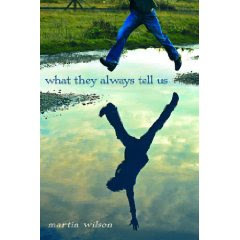 What They Always Tell Us highlights the ups and downs of teen life, from relationships to school, in a contemplative and affecting way. Wilson's characters are wonderfully normal and real, flawed and talented, who accentuate the insightfulness of the book, and the struggles that the go through that go hand in hand with growing up are convincing. Wilson doesn't sugar coat things or talk down to his audience: the language and the content reflect the lives of teens today, making What They Always Tell Us very relatable and believable to teens today, and Wilson's humor and low-key style make this read especially appealing to reluctant readers, despite its slightly slow pace. Smart, witty, and complex, and yet wonderfully simple at the same time, What They Always Tell Us poignant without being mushy, and moving without being cliché. Nice review. Sounds like a a solid YA novel. I've got this in my TBR pile- glad to hear that you enjoyed it! I'm excited to read it. wow. this sounds really good. this book was really good. i loved the the way the book takes a expected turn but goes about it in a unexpected matter.